Now this is luxury. Basking in the sun in the middle of the scenic Adirondacks, enjoying the crisp air of the early spring. The leaves are bright and green and seem to stretch on into forever, as if this wood was the whole world itself. Up here, taking in the expanse of Upstate New York, it’s easy to believe that we’re the only people in the world, and that there’s no massive zombie horde almost certainly chasing us down, and perhaps even now lurking in this sylvan wonderland, stalking between the trees in dread pursuit of our flesh and blood, that they may feast. So just kick back, relax, and take a seat on any one of these beautiful Adirondack chairs. 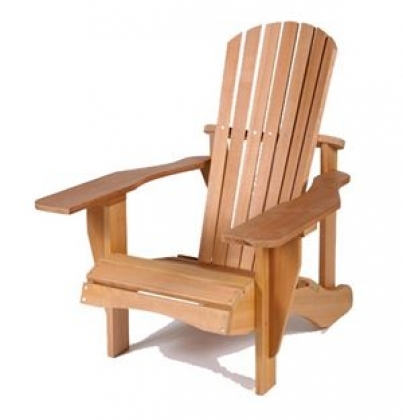 I’m a pretty big fan of this one, the Cedar Delite Western Red Cedar Small Adirondack Chair with Exterior Stain. It’s made with 100% beautiful Canadian Western Red Cedar in that classic Adirondack style that just screams “weekend at the Finger Lakes with FDR in a world totally not swarming with the undead.” I mean, yeah, FDR had to fight a war, but that’s gotta be less stressful than the collapse of all human civilization under the weight of a zombie plague. So let’s just pretend that never happened for a few days and relax. We’ve got a lot of travelling ahead of us coming up. No, I don’t hear anything. Nothing is more relaxing than this elegant, sloping grain. We can lay out and forget our horrifying worries, and dream a little dream of swimming and brandy and little tiny hot dogs on sticks. And unlike our deathly pursuers, this wood is extremely resistant to decay, so it’ll be looking beautiful long after this entire continent has been abandoned to the walking dead. Stop panicking. Nothing’s out there, probably, and even if there is, there’s nothing we can do about it, so let’s just kick our legs up on this Rectangle Western Red Cedar Coffee Table, set your drink down on the Red Cedar Atlantic 17″ Round Table, close our eyes, and drift off. If the hordes burst in tonight, I want them to see how utterly unconcerned we were, and how comfortable and refined, before we start breaking it apart to use as weaponry. Zombies or no, AppliancesConnection.com has all the Adirondack chairs you could ask for.